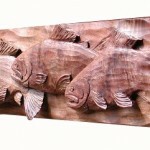 On this page I am including a few of my wildlife carvings: Long Billed Curlew, Mountain Goat, Brook Trout and Coho Salmon. 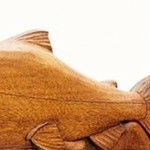 The fish are part of other pieces seen on this site while the curlew and mountain goat will appear only here. 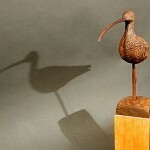 The Curlew is carved from a single block of walnut with a rosewood beak and leg. He was commissioned as a gift for a decoy collector who was looking to diversify his collection with an artistic piece or two. 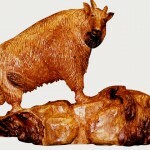 The Mountain Goat is carved from a Black Cherry Burl chunk which was commissioned to be given to a mountain guide in British Columbia who went above and beyond the call of duty. Years later I was contacted by an Art auction agency that was selling off the guides collection after he had passed.